Kolkata Knight Riders have been a part of the Indian Premier League ever since the league's inception in 2008. Bollywood celebrity Shahrukh Khan is one of the owners of the franchise, which represents the state of West Bengal in the league. Popularly known as KKR, the team has been successful in winning 2 IPL trophies in 11 seasons. The Knight Riders started their IPL journey under the leadership of the Prince of Kolkata, Sourav Ganguly. However, the legendary player could not help KKR in achieving the success the team owners would have wished for. So KKR released him ahead of the 4th season and bought Gautam Gambhir in the auction. The Delhi player changed the fortunes of the franchise as the Purple Army won both of their IPL titles under Gambhir. They have performed well in every season since 2011. Their batting, bowling and fielding have all been up to the mark. However, the same was not the case with their batting department from 2008 to 2010. The fact that their 3 lowest totals in IPL history have come in that time period reinforces the above statement. In the 4th match of the 2nd edition of the IPL, Kolkata Knight Riders locked horns with Deccan Chargers. 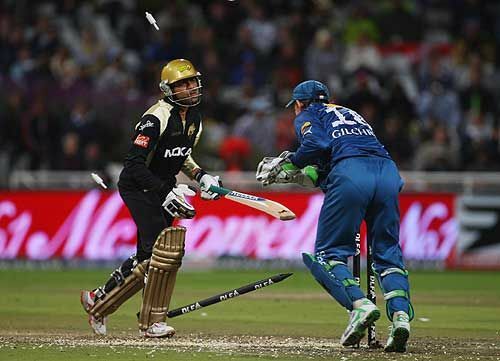 KKR captain Brendon McCullum won the toss and elected to bat first, but never in his dreams would he have imagined that his side would be bowled out for a total of 101 runs in 19.4 overs. Australian batsman Brad Hodge was the top-scorer of that innings with 31, as no other batsman was able to register more than 11 runs. RP Singh and Pragyan Ojha were the wreckers in chief as they combined to take 6 wickets. Deccan Chargers chased down the target in just 13.1 overs, losing just 2 wickets, and grabbed 2 points from that encounter.